We're always interested in Joint-Ventures between ourselves and other quality ezines, or writers of quality articles on Internet Marketing related topics. Our primary concern is always our readership. So, if you believe that you have some valuable Joint-Venture please communicate with us, as below. As a quality resource on netBIZ related topics it's our Editorial policy at The e*Analyst Ezine to always "remain on topic." Therefore, we are very selective about the Add swaps we participate in. 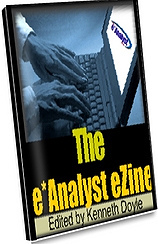 Rather than just placing other writers *on-topic* articles in The e*Analyst Ezine we're more interested in exchanging quality articles with netBIZ theme related ezines, because this benefits our readership. By nature we just love to "trade horses" at the e*Analyst, so we're always open to innovative Joint Venture ideas. With any such proposal we'll always ask ourselves the question "Will the e*Analyst Ezine readership benefit from this proposed Joint Venture?"